We are all very excited here to announce the publication of our Fall/Winter edition! On sale on December 23, 2015, the Fall/Winter edition highlights writing and art from our website. 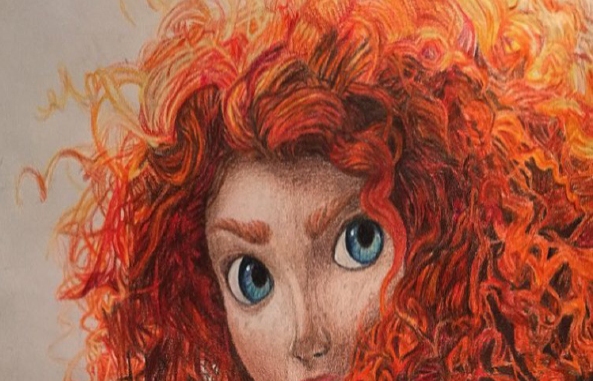 A special congratulations goes to out to Blackbird Review artist Kerry O’Neill, whose colored pencil drawing “I Want to Change my Fate (Merida)” was awarded the cover design by a vote of the Blackbird Review staff. Kerry has been featured in the magazine for the last two years. The Fall/Winter 2015 issue marks our tenth year of production and ushers in the sixth edition of the magazine to be published. Our inaugural issue came out in the fall of 2005, and we have continued, minus a few years of hiatus due to many factors, pretty much since. The works of hundreds of Voorheesville students have been showcased in print and online over the years, and over the next few months we’ll make a point of dusting off and reprinting some older works from the last decade! And to get us started, here’s the introductory essay I wrote for that first issue in 2005. It’s been a fantastic decade of The Blackbird Review! Here’s to the next. The thing that we all struggle with, whether we’re staring at a blank canvas or a blank screen, is this: where does it come from? Creativity. The muse. Inspiration. What is the source of our creativity? I get to see creativity in spades, being a writing teacher. I have been witness to all kinds of creative endeavors, and yet I can’t seem to get any closer to the source than others. As a fiction writer myself I have often been asked where the seeds of my own creations lie; a situation that usually elicits a fancy dance of sorts on my part. I can hem and haw as well as the next person stumped for an answer. It is tempting just to say that I don’t know, but that would seem to betray my years of training. Not being one prone to hyperbole or false acknowledgement of my own powers, though, always precludes me from creating a fiction to describe the art of fiction. So I’m usually stuck when pinned down to this point, and usually settle on this solution to the question that the likes of Aristotle, Shakespeare, and Wordsworth both grappled with and could not answer: the source of our creativity, our muse, exists solely in our relationship with the world. Plain and simple, I know, but true. If there’s one thing I have learned from my years of writing and teaching it’s that the source of all my ideas comes from some murky corner of my own psyche, the corner that doesn’t get much light but has paid very close attention to the world around me. To this end, I suggest that for the budding artist there is no substitute for experience. From travel, for example, comes ideas. A trip to Spain evokes a story of a fifteen year old boy attempting to evade his parents’ watchful eyes. My honeymoon in Rockport inspired my first published story nearly ten years after it happened: and although the events in the story in no way mimicked that trip, the authenticity, the sense of voice, was right on target. But there are other things that inspire. Daily life is full of inspirational events. One activity I enjoy having creative writing students do is to take a headline from the local paper and expand it into a full story. The results are often bizarre, hilarious, and inspiring. And there are so many other techniques for getting started that I can’t list them all here. The sources of our creativity are both varied and complex. In the end, most artists won’t narrow down their inspiration to one thing, but will continue to enhance the mystery of creation. The writers and artists in this magazine are no different. As students, their work has, for the most part, been assigned by well meaning instructors. But what they do with the assignment, well that’s another thing entirely. 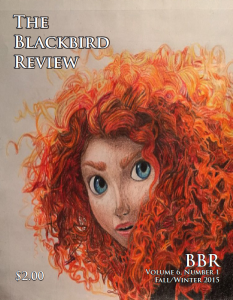 Enjoy this first full student edition of the Blackbird Review. May it continue to be a source of inspiration for all of us who aspire to write, or paint, or sketch.